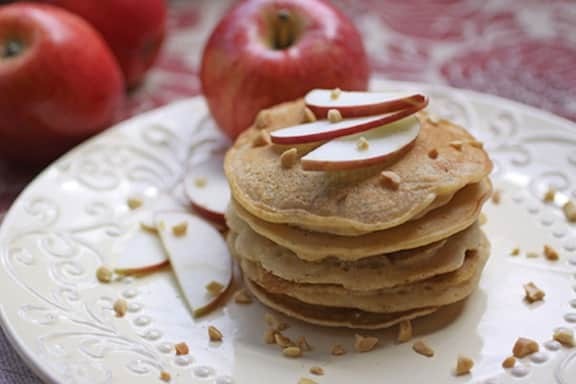 Apple slices with nut butter are a great healthy snack. Now, this delicious flavor combo can be enjoyed in these luscious pancakes. For gluten-free, use gluten-free flour. This recipe makes eight pancakes. From Nut Butter Universe* by Robin Robertson. © 2013 Robin Robertson. Used by permission from Vegan Heritage Press. Photo by Lori Maffei. In a blender, combine the milk, apple juice, almond butter, and vanilla and blend until smooth. Pour into the flour mixture, stirring with a few swift strokes until just moist. Fold in the chopped apple and almonds. Preheat the oven to 200°F. Lightly oil a griddle or non-stick skillet and heat until hot. Ladle about 1/4 cup of the batter onto the griddle or skillet. Cook on one side until small bubbles appear on the top of the pancakes, about 2 minutes. Flip the pancakes with a spatula and cook until the second side is lightly browned, about 1 minute longer. Repeat with the remaining batter. Keep the cooked pancakes warm in the oven while preparing the remaining pancakes. Here are more easy vegan breakfast recipes and ideas. * This post contains affiliate links. If the product is purchased by linking through this review, VegKitchen receives a modest commission, which helps maintain our site and helps it to continue growing!